It’s hard to believe we’ve started the last month of summer. Where has the time gone? I had a much-needed break from my normal blogging schedule (which, I admit has been pretty insane the last several months). Summer time seems to be a rather busy time around my house – lots of out-of-the-house activities that keep the kids (and me) busy (and away from my computer) Although I probably won’t return to full work activity until the kids get back to school, I am excited to dig in to some fun topics as we finish up the last few weeks of summer. I decided to go with a top 10 theme – here is a quick list of 10 blog prompts that are top 10 or lists of 10. Have fun with them and see what other “TEN” posts you could come up with! 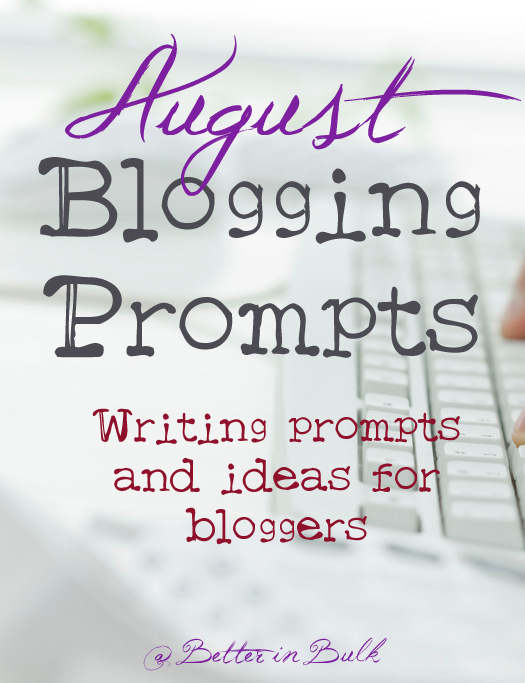 Check out all of my other blog prompt posts for more ideas! Hopefully one or two of these writing prompts is what you need to get over the hurdle of writer’s block (I know *I* suffer from writer’s blog all too often. What about you?) Give me a topic and I can write about it. Give me a blank screen and no ideas, and that screen will remain blank for far too long.